Know thyself: Are you an investor or a trader? Venezuelan misery: 1 million percent inflation? If you can’t use dollars to trade with Iran, how about tea? Is Trump really using the North Korea playbook with Iran? “Investing and trading are two very different methods of attempting to profit in the financial markets,” says an article at Investopedia. Too often, you hear the media use the terms interchangeably. But the difference is huge — the difference between lightning and the lightning bug, as Mark Twain would say — and if you don’t pay heed to that difference, it could be disastrous for your financial fortunes. To help draw the line between one and the other, we bring in Tim Sykes — trader par excellence, the man who took $12,415 of bar mitzvah gifts as a teenager in 1999, started day-trading and parlayed it into a $2 million fortune by the time he graduated from Tulane. “I’ll start with what both traders and investors like most — money,” says Tim. Then there’s the time horizon. “Investors like fundamental analysis,” Tim says, “engaging in long and intensive research of companies, their financial statements, competitors, performance and global trends to get as much as data about companies before making their own decisions about what to buy. “To the contrary, traders don’t waste as much time on that; they primarily keep up with technical analysis in their work and use fundamentals in a supporting role only. There’s a critical commonality, though — “You have to be prepared for unpleasant surprises.” How they approach unpleasant surprises is where investors and traders part company. Either way, nothing is guaranteed. “In the case of a trader, you might lose a big chunk of money on any given day. Certainly, all of your daily trades aren’t going to be winners. “Faith is something that could be attributed more to investors,” Tim says: “Faith in the strong future performance of a stock, for instance. It’s something traders don’t tend to have. “If making money on your money is a religion, then investors are true believers and traders are agnostics. “A trader puts a lot more effort, every day, into many different stocks,” Tim goes on. “We get up early every day and run loads of technical analyses to find a few that hold promise for the day. Then we do it all over again, endlessly. [Ed. note: You don’t have to stay glued to a screen all day to bag big profits from Tim’s “weekend strategy.” All you need to do is place a buy order on Friday, enjoy your weekend as normal and then place a sell order on Monday… and collect sums as large as $15,820. It’s a sleepy summer day in the markets. The major U.S. stock indexes are mixed — the S&P 500 and the Nasdaq up slightly and the Dow down slightly. Before the open, Boeing and General Motors both delivered earnings disappointments. Boeing’s earnings were fine, but revenue missed estimates thanks to weakness in its commercial aircraft division. At last check BA shares are down close to 3%. GM’s earnings were fine too, but the company trimmed its outlook for the rest of the year thanks to — drumroll please — rising steel and aluminum prices fueled by tariffs. At last check, GM has tumbled 7% on the day. We can’t wait for the White House to “solve” the problem of GM’s rising costs by… slapping tariffs on imported cars. Hey, why not? Yesterday the administration announced plans to help U.S. farmers groaning under the weight of trade disputes by… giving them a $12 billion subsidy. Gold languishes at $1,228. Crude is back above $69 after the Energy Department’s weekly inventory numbers, which registered a bigger drop than expected. The big economic number of the day is new home sales — which fell 5.3% in June to an eight-month low. And that’s even though the median price for new construction fell 2.5%, to $302,100. It’s the latest in a string of numbers showing weakness in the housing market. 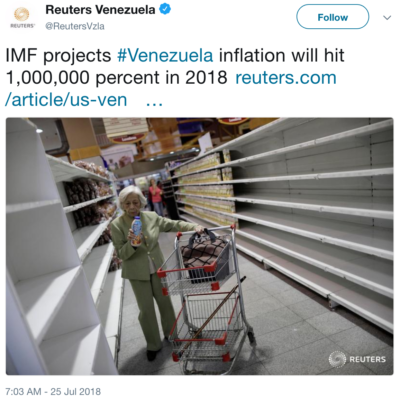 For the record: The International Monetary Fund forecasts inflation in Venezuela could top 1 million percent by the end of this year. The IMF’s Alejandro Werner is drawing an explicit comparison with Zimbabwe a decade ago and Weimar Germany nearly a century ago. “The collapse in economic activity, hyperinflation, and increasing deterioration… will lead to intensifying spillover effects on neighboring countries,” Werner warns. As it stands even now, the situation is desperate. According to the Troubled Currencies Project run by Johns Hopkins economist Steve Hanke, inflation in Venezuela — based on the black-market exchange rate between the bolivar and the dollar — is running 6,888%. And that’s as of March 30. A follow-up to our lead item on Monday: Seems everyone’s looking to end-run the new U.S. sanctions on Iran. A top German diplomat named Niels Annen paid a call on Indian leaders in New Delhi this week. The Germans are among the Europeans chafing at the sanctions. India is Iran’s No. 2 oil buyer after China. Annen all but told the Indians to ignore the sanctions, which he called “irritating, to put it mildly. “I am not a salesman for Iran, but I have an impression that India is willing to continue buying oil from Iran and this will be a very important statement,” Annen told Indian reporters, as related by the Russian news site Sputnik. As we mentioned last month, Indian leaders are looking to revive a scheme under which India paid for Iranian oil with Indian rupees, channeled through a small state bank. In turn, Iran used those funds to import Indian goods. That would bypass the U.S. dollar. Today, by the way, marks the start of the annual BRICS summit between the leaders of Brazil, Russia, India, China and South Africa. Hard to believe end-running the sanctions isn’t on the agenda, if only unofficially. Meanwhile, the island nation just south of India has come up with its own novel scheme to keep trading with Iran: Call it oil for tea. The state oil company of Sri Lanka owes Iran about $250 million for oil imports in recent months. That sum roughly equals the value of the tea Iran imports from Sri Lanka each year. 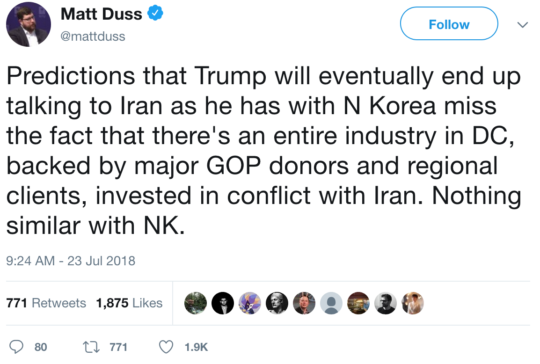 At this moment we should address the suggestion that Donald Trump is playing 11-dimensional chess with Iran and he’s looking to achieve a North Korea-style reconciliation. Left unsaid is what a “real deal” would look like. North Korea has working nuclear weapons it can bargain away. In contrast, Iran has no nukes and its nuclear energy program is the most rigorously inspected in the history of humans splitting atoms. Major Democratic donors too, we’ll add — think Power Rangers creator Haim Saban — even if Mr. Duss wants to ruffle Dem feathers by acknowledging that fact. And the Korean gambit is starting to look a little rocky, too. Satellite imagery shows the North Korean regime has begun dismantling a missile test site — a good-faith gesture after the Singapore summit, something Pyongyang is under zero obligation to do — but Secretary of State Pompeo is complaining that international inspectors aren’t there to witness it. To the mailbag, where a reader informs us “Iran supplies about 90% of the world’s saffron production” — an assertion that checks out with Wikipedia, if you’re wondering. “I assume you know that saffron is a spice with lots of health benefits. My daughter just gave me 5 grams of it for my birthday. That’s why I did a little investigation to find out more about saffron and its production. “The price of saffron is quite high, approaching the price of precious metals. One pound of it would cost in the range of $1,500, I am told. But why would Iran account for 90% of the world’s production? Cost of labor. The flower from which the saffron stems are taken produces just three stems per flower. It takes 170,000 of these flowers to produce one pound of saffron threads. “Apparently there is lots of unemployment in Iran. The work with saffron is done almost exclusively by women who are paid about $5 per day. As it turns out, anyone, even you or me, could grow our own saffron, but I know the effort is not worth the benefit for me. I have never previously used this spice and I certainly will not buy it at current prices. I did check the price in my local grocery store. They wanted about $13.50 for a couple of micrograms. The 5: What?! Your family might be funding terrorism with those saffron purchases. Bad American! P.S. Hard to believe, but people just like you are collecting 72-hour payouts as much as five times the size of a typical Social Security check. In on Friday, out on Monday — using Tim Sykes’ weekend trading strategy. Only you don’t have to check your phone or computer over the weekend — just go on with your weekend as you usually would. A fellow from Michigan named Steve pulled down $7,500 using this technique just the other weekend. But if you don’t act before 3:00 p.m. EDT on Friday — basically, an hour before the market closes — you’ll miss out. Learn about the one simple step to take before then to collect big.